S. Rosen's® Bread Marble Rye Swirled. No trans fat. See back panel for nutritional information. Since 1909. Restaurant size. Swirled with caraway seeds. "Old world taste." Great Sandwiches Start With Great Bread!®. The authentic deli sandwich bread. Samuel Rosen always loved bread... it was his passion. He was awarded his master baker's certificate at the age of 12 and moved from Europe to America that same year, 1898. By 1902, he owned his very own bakery in New York City and by 1909 moved to larger facilities in Chicago. Samuel Rosen's pride in the taste and quality of his breads has been maintained now through three generations of Rosen's family, becoming something of a legend in Chicago and throughout the United States. Enjoy old world heritage and flavor in this authentic swirled marble rye bread with caraway seeds. The hearty, robust flavor is perfect for deli style sandwiches or any hearty sandwiches. "A truly delicious way to make your sandwich special." Bread provides complex carbohydrates for energy and is a naturally low fat food. Visit alphabaking.com for more information. www.alphabaking.com. 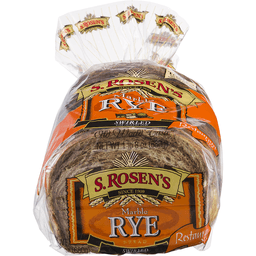 S. Rosen's® Bread Bohemian Style Rye Unseeded. No trans fat. See back panel for nutritional information. Since 1909. Restaurant size. "Old world taste". Great Sandwiches Start With Great Bread!®. The authentic deli sandwich bread. Samuel Rosen always loved bread... it was his passion. He was awarded his master baker's certificate at the age of 12 and moved from Europe to America that same year, 1898. By 1902, he owned his very own bakery in New York City and by 1909 moved to larger facilities in Chicago. 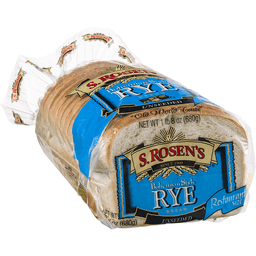 Samuel Rosen's pride in the taste and quality of his breads has been maintained now through three generations of Rosen's family, becoming something of a legend in Chicago and throughout the United States. Enjoy old world heritage and flavor in this authentic Bohemian style seedless rye bread. The hearty, robust flavor gives distinction to special sandwiches. "A truly delicious way to make your sandwich special." Bread provides complex carbohydrates for energy and is a naturally low fat food. BCTGM. Visit alphabaking.com for more information. www.alphabaking.com.